As a newly divorced, thirty-something, male, I've had a few revelations of late. Chief among them is the fact that, for what little cooking my ex-wife actually did, I now find myself in dire straits to procure sustenance for myself on a semi-regular basis. As a result, I find myself flying solo, eating out more, and sampling the local fare. Honestly, not a bad outcome given that I've lived here for three years and never eaten here. So, naturally, it occurred to me that rather than sitting awkwardly alone, I could pass the time by providing dining tips to others (Plus, it looks less awkward to be alone and typing feverishly on one's phone, than it does to simply be alone amidst a sea of couples and families). Talk about reliving high school prom. On this Sunday brunch, I found myself nary a block from my apartment building, having lunch at Roxie's on Grand (http://roxiesongrand.com/). The staff on this visit was harried due to the lunch rush, but they were perfunctory, professional, and efficient, which is exactly what I want as a single man dining alone. No chit chat. Just give me my food. And leave me to it. 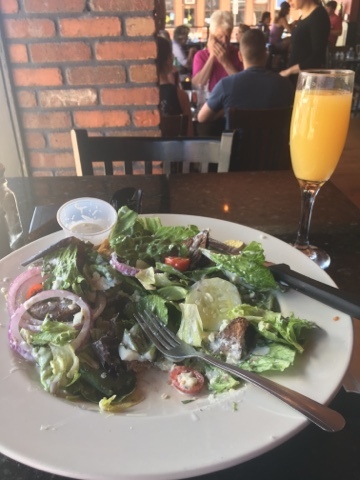 I ordered a mimosa and one of the brunch salad options - Roxie's own "Black and Bleu" salad which consists of sirloin strips, blue cheese, hard boiled egg, tomatoes, and bleu cheese dressing. The salad paired really well with the mimosa. A lite Summer's lunch for a wam day. The mimosa was unremarkable. A bit too little champagne, and a bit too much orange juice. But it seemed to offset the taste of bleu cheese which is normally too pungent for me. In the Roxie's configuration, however, it all worked together really well. The salad ingredients paired extremely well with the mimosa. None too overbearing. With just a hint of bleu cheese to keep the bites interesting. It was enough to make me think that "brunch" should be a thing. On the other hand, the sirloin strips, I ordered cooked medium well. Having been around lawyers, and an ex out for blood, the thought of anything rare leaves me nauseous. But they were a drop over cooked. Not really the fault of the staff, but perhaps the stove was running a bit warm today. It was all eminently edible of course, and I quickly gobbled it all down. 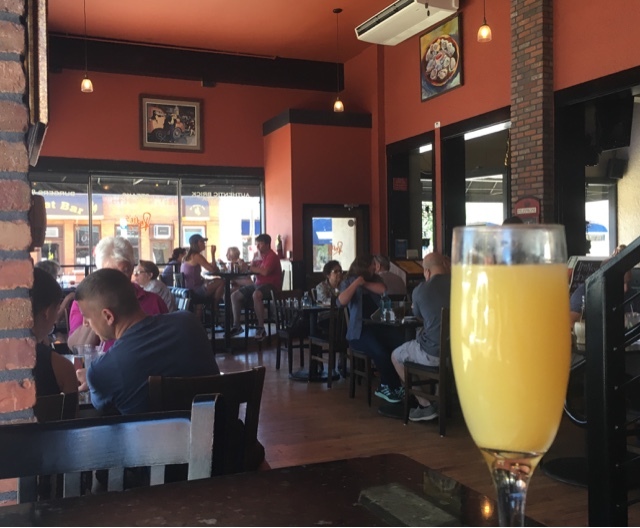 I polished brunch off with an O'Dell's IPA - a beer with just enough citrus to keep things lite, and I left feeling sated. Mostly, I no longer gave a damn that I was eating alone. Overall, the damage was $32.25. I happily left a 20% tip, and returned to my place for an afternoon of Call of Duty.